Council accepts that climate has changed in recent decades and scientific evidence indicates this trend will continue . Early impacts on forest ecosystems are now being detected. Therefore, Council believes that the risk of status-quo forest management exceeds the risk of making changes to management practices. Council’s primary concerns are loss of forest productivity due to inadequate adaptation of current commercial tree species, loss of genetic resources due to localized extinction of populations, and impacts on forest ecosystems such as increased pest and disease outbreaks, extreme climate events, and increased forest fire frequency and intensity. Because of the long-term nature of forestry, Council believes that adaptation strategies for forest resource management should be implemented as soon as possible to mitigate anticipated impacts of climate change. Council recommends the use of research results and pilot projects to adapt the current reforestation practices to climate-informed resource management strategies. 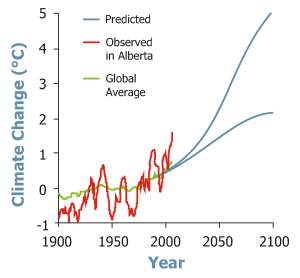 Climate change over the last half century has increased mean annual temperatures by almost 1°C across Alberta. This trend is expected to continue, resulting in warming by about 2 or 3 °C over the next 50 years. Regional and seasonal patterns of precipitation may also change substantially. Such changes create new challenges for forest management, and forest-based communities which rely both economically and socially on the resource. Even though warming by 2-3°C does not sound very threatening, the effect on forests could be substantial. The following figure shows how the tree and plant communities of today might be located in order to be well adapted to the predicted climates of the 2020s, 2050s and 2080s. The forests we see today are the result of thousands of years of natural evolution and ecological processes. The anticipated change in climate may be too rapid and severe for successful adaptation by our current forest trees. Tree populations can naturally “move” by way of seed dispersal to more suitable regions and climates – but these are slow processes. Careful and well-planned tree breeding and movement of planting stock (further north and/or to higher elevations) during reforestation activities can assist in population adaptation. 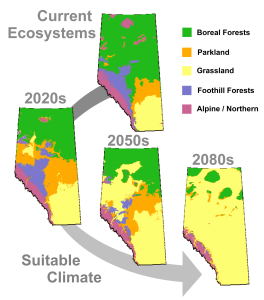 Well established and carefully regulated tree-breeding work in Alberta is already providing data and seedlings to help forest managers prepare for these anticipated changes. Genetic field testing of planting stock has been done in Alberta for the past 25 years, which has allowed us to generate some preliminary information to guide these activities. Further tests specifically designed to answer these questions are under development. Researchers in government, academia and industry are working to better understand the response of forest trees and ecosystems to possible future climate change scenarios. Some species are likely to benefit from warmer climates with increased growth rates and an expanded range, whereas other species could disappear from some regions. We believe knowledge is key to making the right decisions about forest management today and in the future. Council will advise the government of Alberta on potential adaptation strategies, as well as on research and resource needs. Council will also develop an educational plan for the public and inform other researchers and decision-makers about climate change and its effects on genetic adaptation. It will also work to promote development of adaptation strategies with non-governmental sectors and industry.